In case Longhair is being too coy for you, the bike enthusiasts he's talking about are the Hells Angels. How do we know? The ball-peen hammer is a tell. The Angels have a long-standing fondness for the tool, such that it's all but considered the group's trademark weapon. Still, patches or pins displaying hammers are ancillary to the marquee feature of a biker-gang jacket: the big patches on the back that bikers call their colors. (The term may extend to the entire garment they're sewn on.) Often these consist of three separate pieces: two arc-shaped patches above and below, called "rockers," naming the organization and the local chapter, and in between the club's insignia—in the Angels' case, a winged skull in profile. Think of these as the foundational text of a jacket, and the surrounding patches as chapters added later, identifying things like preferred weapon (hence the hammer), past drug use, or incarceration history. Variously colored wings, meanwhile, are said to indicate different outré sexual acts the wearer has gotten up to, so be sure to ask what each means next time you see your pal's son and his cronies. You might also notice a patch bearing the device "1%." Here the biker is proclaiming that he belongs to a group whose business may not be entirely on the up and up, a category covering not just the Angels but also rival clubs like the Bandidos, the Pagans, the Sons of Silence, et al. (Extralegal activities might include things like violence, drug-dealing and gunrunning.) The emblem refers to a PR statement once issued by the American Motorcyclist Association—in a defensive crouch after unruly biker behavior first seized the public's attention—to the effect that 99 percent of the riders out there were law-abiding, leaving just 1 percent who weren't. 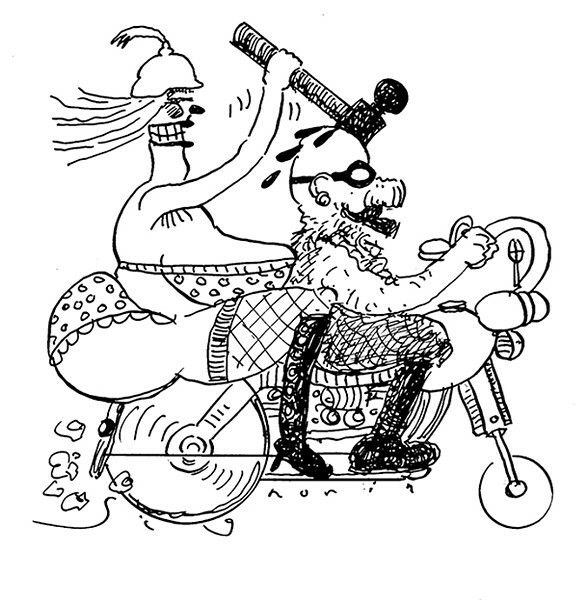 This distinction was drawn back in 1947, meaning the motorcycling one-percenters long predate the Occupy Wall Street-era bogeymen who've now claimed their own place in the ranks of American villainy; where one wields a hammer to protect his take, the other might use an account in the Caymans. Why the ball-peen, specifically? If any one Hells Angel started the tradition, he's been lost to history, but you'll find that, broadly, bikers of the 1 percent like carrying around mayhem-ready implements that can at least nominally pass as being otherwise useful: I swear, officer—my old lady's antique steam boiler needs riveting. Various outlaw factions are associated with different signature tools; the Sons of Silence, for instance, prefer utility flashlights. Screwdrivers are another popular option. The Angels' affinity for the ball-peen hammer goes back decades and continues today. Hunter S. Thompson's 1966 book on the gang doesn't mention hammers, true, but a later memoir by group leader Sonny Barger recalled punishment he'd visited on some guys who'd tried to steal his bike circa '68: "We bullwhipped them and beat them with spiked dog collars, broke their fingers with ball-peen hammers." A Reuters report describes a 2010 melee in Santa Cruz, Calif., where Angels squared off against members of another outlaw club called the Vagos, "some wielding ball-peen hammers." (Their beef? Who'd get to hang out at the local Starbucks.) Over the border in British Columbia, two Angels pleaded guilty in 2014 to beating a man to death with baseball bats and ball-peens. In an age of endless novelty, it's nice to see folks still doing it the old-fashioned way. Biker gangs like the Angels tend to be a bit touchy about their identifying garb—enough so that the medical literature has taken note. One entertaining paper I came across gives hospital emergency staff the skinny on what to do if an injured outlaw shows up. "Should a biker's colors be removed during the course of his care," its authors write, "physicians and staff would be prudent to treat his colors with respect or otherwise risk a hostile reaction." On the other hand, there's evidence these guys might be open to gentler methods of apparel-related conflict resolution. A 2013 New York Times article described the Hells Angels' impressive legal apparatus, and their newfound enthusiasm for litigation over, say, laceration. This extends to the 18 versions of their symbols the organization has trademarked, which they guard aggressively. In 2008 the group went after a T-shirt maker who'd used the Angels' name in its designs—defense counsel later commended the plaintiffs for conducting business "civilly"—and in 2013 they sued Toys "R" Us, which was selling a yo-yo with an Angels-style death's head on it. (Not your grandma's Toys "R" Us anymore, apparently.) Both cases were settled out of court—but fortunately not too far out of court. Write to Adams c/o Chicago Reader,350 N. Orleans, Chicago, Ill, 60654.